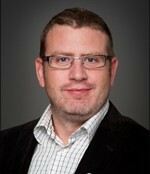 Dr. Couture's laboratory focuses on understanding the mechanisms that cause leukemia. Specifically, to understand how the protein Myeloid Lymphoma Leukemia (MLL) participates in cancer progression and aggressiveness. Visit the researcher's webpage, or visit their faculty webpage. 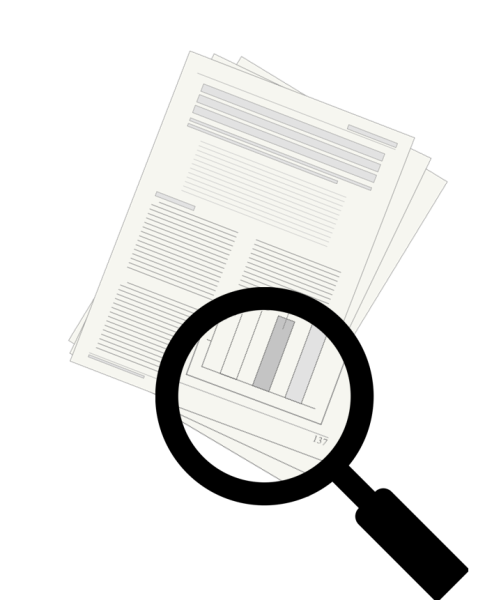 Identify recent publications from their lab and read up to understand the projects undertaken by the investigator. Your email must fill the following requirements. If CV or Transcript is indicated, you must attach these documents when sending a request to the researcher. After having read some literature on the projects undertaken by your potential lab supervisor, it is important to introduce yourself in a right way in order to incite interest from the principle investigator. Keep in mind that these researchers receive a lot of emails daily, they won’t be reading a multi-page autobiography. Try to convey all the necessary information while keep your email concise and unique. The email you will be writing should be conveyed to only one recipient, it is crucial to tailor emails to each individual professors. Generic emails will most certainly be identified and deleted. Avoid simple titles such as “Research” or “Lab Position”. Keep your title short, while giving a good sense of your email inquiry. Ideal titles include “Undergraduate research lab position”, “Summer Research Opportunity”, etc. When writing your potential supervisor for the first time, it is essential to address the supervisor in a formal manner. It is very important to avoid generic greetings such as “To whom it may concern”, generic emails are almost always rejected by researchers. Greetings such as “Dr. X” or “Dear Dr. X” are acceptable. Greetings such as “Dear Mr. X” or “Dear Mrs. X” can be used if the supervisor does not have a doctorate or M.D degree. In situations of uncertainty, refer to the supervisor as “Dr.” (better to mistake the supervisor as a “Dr.” then to mistakenly refer to them as something else). Note that in American English, abbreviations are always following by a period. In French, the period is omitted unless the last letter of the abbreviated word is absent (“Dr X” for male or “Dre X” for female). 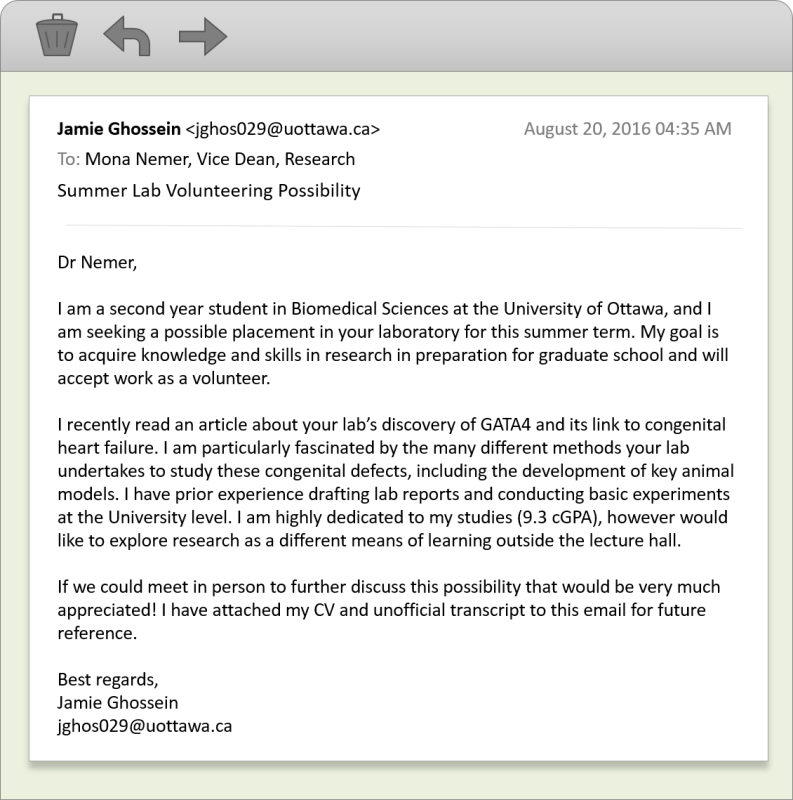 The email should follow with your goal (why you are looking to undertake a research position). In most cases, students are looking to undertake research to improve their skillset and make them more competitive for programs as part of graduate school, pharmacy, dentistry, medicine, etc. Stating your future intentions is acceptable, however avoid conveying a bad intention such as “I am seeking a lab position as a pre-med in order to make me more competitive for med school”. The researcher might get turned away by those type of statements. Professors want to hear why you are interested in research, what fascinates you in research, your intentions. If you’re are motivated by a personal matter, it does not hurt to share this with the professor as this will further convince them of your motive. A good example of this is: “I am seeking lab experience in preparation to undertake graduate studies in the next year” or “I take particular interest in your lab as chronic heart failure has been an interest in mine ever since my grandmother have been suffering from the disease last fall.” Keep in mind not to sound too ambitious, you won’t be curing cancer during your summer placement in the lab. At this point of the email, you want to include why you have contacted specifically this supervisor. If you met the researcher in a specific class or event, feel free to include this in the email. If not, you may continue by stating the reason you applied to this lab in particular. Saying that you’re fascinated about protein folding is good, but definitely do not stop there! Demonstrate that you have taken the time to read and understand the recent findings and projects of the lab. Read recent publications and papers and mention details more specific than simply the general description on the faculty website. You don’t have to be an expert in the field, but it helps to demonstrate that you have taken the time to understand the topic of research before contacting the lab. This section will make you stand out from other applicants. Finish the body of the email by stating any relevant experiences that will make you suitable for a position in the laboratory. This is your chance to sell yourself to the professor and convince them that you will make a good addition to their lab. Including your GPA is ideal only if it deserves merit. Do not make it a center point of a sentence, “I am succeeding well in my classes (9.2 cGPA), however I feel like I will learn better by exploring science beyond the classroom”. 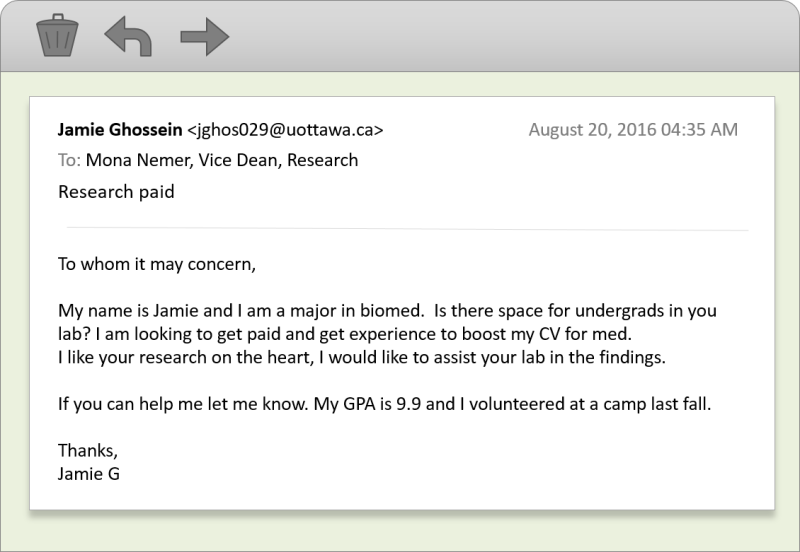 The GPA is most certainly not the only criteria a Principle Investigator will use to consider you for a lab placement. If your GPA is on the low end, you may omit including it until further required. You should rather speak about relevant experiences that would make you suitable for a lab placement. Always finish your email by thanking the researcher for their time. It is important to express interest in meeting them in person to further discuss this possibility. It may be helpful to include your CV (mention that you have attached your CV if you have done so). This will allow them to have a better understanding of your past experiences and qualifications. If your academic standing is not as high, you may choose to put off attaching a CV or transcript to the email, but mention that you would be happy to supply such materials if needed. Demonstrating good attributes goes much further than simply a strong GPA! ​ ​Note that some researchers will make it a requirement to attach your CV or Transcript, and hence you must fulfill this requirement when contacting that specific researcher. You may finish your email with a simple “Sincerely” or “Best Regards”. You may also invite the researcher to contact you by email (include your contact email below your closing). - Keep your email concise. You can include all necessary information in two paragraphs. As a good measure, your email shouldn’t exit the field of view of the window in your email client. - Proofread your email very carefully, consider having a friend or colleague proofread the email as well. Grammar and spelling mistakes convey a bad message to the researcher (that you haven’t taken the necessary attention in writing your email, even if this is not the case). - The email does not need to be bland, give your email some humanity and let your personality shine through!